Banish 10 cards from the top of your Deck, face-down; draw 2 cards. You can only activate 1 "Pot of Desires" per turn. In appearance, this pot is a combination of Pot of Greed and Pot of Avarice. 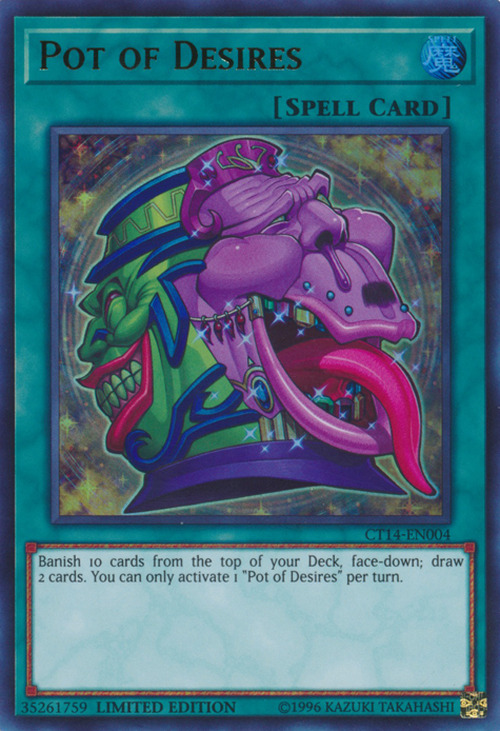 This card's Japanese name, Pot of Greed and Avarice, is a combination of the Japanese names of Pot of Greed and Pot of Avarice. This card's absurdly high cost can serve as a warning against greed, since you run the risk of banishing important cards and Decking Out sooner just to draw 2 cards. While its consequences are much less severe, Reckless Greed shares this concept. Along with Performapal Bubblebowwow, this card's English TCG name was first revealed in the Scripted Duel North American WCQ 2016 Special: Yusei vs. Yuya. This pot appears in the artwork of Recall.